The language in the To column can freely change if there are no translations added by the user yet. The popup does not appear in the user has uploaded the file to Commons before trying to switch languages. It only needs to know clean/dirty and not if the content is the same as before. 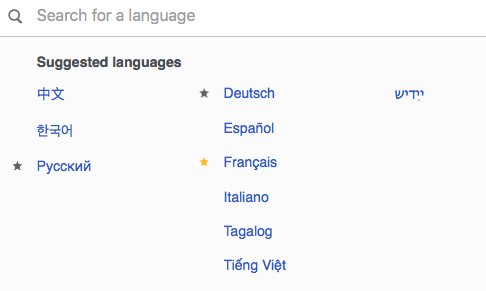 If the selected To language already has translations in the SVG, the inputs get populated with those translations. Niharika triaged this task as Normal priority. Niharika added a project: Community-Tech. Niharika moved this task from Untriaged to In Design on the Community-Tech board. @Prtksxna Flagging this for you, Prateek. If you don't have any questions/suggestions, please unassign yourself and place this in the Estimation column. Thank you. Or would that be the scope of another ticket? My suspicion is that this will take a bit of creative cheating as well as a storage method (cookie or local Storage), so I'd say let's split that part up to another ticket. This one can deal only with implementing uls and having it apply the chosen language. The second ticket can deal with storage in cookies, marking languages as existing in the ULS dialog, etc. Prtksxna removed Prtksxna as the assignee of this task. If the user has not selected any Preferred language in their settings, then the languages chosen here should automatically be saved as the preferred (they can always change it later from the settings dialog). Holding off on estimating this until estimation on Oct 30. Niharika moved this task from To be estimated/discussed to Ready for development on the Community-Tech board. Niharika added a project: Community-Tech-Sprint. The image labels change to be in the new From language - only the ones which are not translated yet. These features are already done, merged, and ready for QA. If a user tries to switch the To column after adding any translations, the added translations get lost. The user gets a confirm box before the language switches. This is https://github.com/wikimedia/svgtranslate/pull/51 and it's not yet ready for code review. I'm probably not thinking clearly about this, but it seems to me that this is going to happen without any special action on our part: if the user has entered text (i.e. the form is unsaved) and then clicks one of the buttons, the whole page will reload and they'll be sent back to the same To and From languages and if at that point they switch the To language they'll not get a confirmation because the whole form is in an untouched state. Which is good. :) And the other bits of that happening (the submission and redirect) are all handled in separate tickets aren't they? Yep, the submission and redirect will be handled in the upload image ticket. https://github.com/wikimedia/svgtranslate/pull/51 is ready for review. Patch merged; staging site updated; ready for QA. I've just found a regression with this: the from-language is not switching properly. Will investigate. @Samwilson I still see the broken language switching in production. I can't switch the From language. @Samwilson Works for me! Please update production too. If you can tell me what are the steps to update production, I can do it myself without bothering you over it. Once https://github.com/wikimedia/ToolforgeBundle/pull/12 is resolved, both staging and production will update themselves to master or the latest tag, so this will all be easier. This is ready for QA. Works for me now. I just realized I never updated this task after we changed our preview plans at the offsite meeting. I'll update the task. Niharika closed this task as Resolved. Niharika moved this task from QA to Q3 2018-19 on the Community-Tech-Sprint board. Niharika moved this task from In progress to Done on the SVG Translate Tool board.